The Potassium Iodide Project May 26, 2016 by mutantdaisys MutantDaisys is campaigning for mandatory distribution of Potassium Iodide tablets for all residents living within a 50 mileradius of every Nuclear power station within the United Kingdom. Once we have achieved this goal we want to expand the catchment area further to incorporate all residents living with a 50 miles radius of every Nuclear power station in the world. Currently, the Nuclear industry in the UK only provides Potassium Iodide tablets to all residents living within a 1.5 mileradius of any given Nuclear power plant. This is nothing more than a token inadequate gesture given that the exclusion zone at Chernobyl incorporates a 50 mile radius. 1) To raise awareness of the dangers and consequences on public health posed by Nuclear power, hopefully stimulating organic thought and education on the subject leading to the public questioning the safety of Nuclear power. 2) To expose just how unprepared the country (and the rest of the World) is in the event of a Nuclear emergency at any one of our Nuclear power stations, highlighting the inept emergency and contingency plans that are the responsibility of the Government and the UK Nuclear Industry. This is also designed to provoke thought and questions at just why the UK is so unprepared, and showcase how the authorities are playing ‘Nuclear Russian Roulette’ with public safety by continuing to produce power from our aging fleet of Nuclear reactors. 3) To get mandatory distribution of Potassium Iodide tablets to all residents living within a 50 mile radius of all Nuclear power stations in the UK. This goal is still a very conservative one, given that radiation fallout has been proven to travel hundreds of miles from Fukushima and Chernobyl respectively. Radiation has no consideration for borders. The project will eventually grow to incorporate ALL Nuclear power stations worldwide. The event will run from 8am to 9am in Town Hall Square and will include silent reflection, words and song. Sylvia Boyes, one of the peace campaigners taking part in the event, said: “This country, and all the nuclear weapons states, are planning to upgrade their nuclear weapons arsenals. “Our Government has taken the decision to renew the Trident nuclear bomb system despite the knowledge this perpetuates the threat of nuclear annihilation for generations to come. “This despite the fact that while social care, education and health services need more funding, the cost of Trident is likely to amount to £200 billion. “The European Union referendum may have been a chance-in-a-lifetime, but the issue of the nuclear weapons threat is of equal, if not greater, importance to each and every one of us worldwide. We invite you to join us for the next historic safe energy mobilization–the March for a Clean Energy Revolution, July 24 in Philadelphia. You can find more details on the march below. We have good news and sad news to report today. On at least this occasion, it’s appropriate that they go together. Many of you know that Michael Mariotte, NIRS’s President and long-time Executive Director–and primary sender of these emails–had been struggling with cancer for some time. Recently, that struggle came to an end. Michael passed away a few weeks ago. He has left us all with a legacy of his achievements from which the movement for a nuclear-free world will benefit for many years. We encourage you to visit our memorial webpage to find out more about Michael’s enormous contributions and his unique life, which have been comemorated in some of the U.S.’s most prominent news outlets, as well as in the humble pages of our own Nuclear Monitor and the GreenWorld blog that Michael founded and edited. Michael’s death is a major loss for NIRS and the anti-nuclear movement. His brilliance and hisvoice will never be replaced, so you will notice some changes in the coming months. For instance, emails like this addressed from other NIRS staffers, and soon we will be rolling out one of the last projects Michael was working on: a new and revitalized website and a new image for NIRS, that connects our movements roots to our ongoing work. As Michael would have it, we are continuing the fight–and our work for a nuclear-free, carbon-free world is only expanding. Which brings us to the good news. This summer, we are marching for the Nuclear-Free, Carbon-Free world! Two years ago, 400,000 people joined the historic People’s Climate March in New York City — including thousands who marched with NIRS and the Nuclear-Free, Carbon-Free Contingent. Michael Mariotte was the architect and chief organizer of that enormous, vibrant, and visionary contingent, and our mobilization was one of the moments of which he was proudest. Collectively, we sent an incredibly powerful message that day, which not only led to the first-ever truly global climate action agreement. The visionary statement made by those marching for a nuclear-free, carbon-free world both helped keep nuclear power out of the Obama administration’s Clean Power Plan and, ultimately, prevented the international climate agreement from endorsing it, as well. Join us on July 24 as we March for a Clean Energy Revolution in Philadelphia. The Democratic National Convention will be meeting there starting the next day. The Nuclear-Free, Carbon-Free Contingent will be marching with thousands of anti-fracking, climate justice, First Nations, fair trade, unions, and clean energy activists, demanding an end to dirty energy and a total commitment and a just transition to clean, sustainable, renewable energy. And we need you to join us! Our victories since the People’s Climate March have led to more and more reactor shutdowns, but the nuclear industry hasn’t given up–and their attacks on our clean energy future are getting more severe this year. Dirty energy corporations see the 2016 elections as their opportunity to block renewable energy, no matter who wins the elections. And the nuclear industry is no exception. In fact, there is a nuclear lobbyist and spokesperson on the Democratic Party Platform Committee: Nuclear Matters’ Carol Browner. We need as many No Nukes and safe energy activists as possible to join us in the streets of Philadelphia. Cultural genocide – nuclear waste dumping in Australia: Take a stand! Stop Australia From Committing “Cultural Genocide” and Environmental Injustice http://www.truth-out.org/news/item/36006-stop-australia-from-committing-cultural-genocide-and-environmental-injustice, 14 May 2016 By Jessica Ramos, Care2 | Report Australia is about to make a horrible mistake. The country has (at least, tentatively) earmarked the location of its first nuclear dumping site next to an aboriginal cultural site. And the aboriginal community is speaking out — calling the proposed site “cultural genocide.” Australia is on the path to repeating the United States’ past mistakes and environmental injustices. The traditional lands at the center of the controversy belong to the Adnyamathanha, also known as the “rock people,” from Flinders Ranges, South Australia. In 2009, the Federal Court of Australia recognized the Adnyamathanha’s native rights over 16,000 square miles of territory. But a nuclear dumping site of low- and intermediate-level nuclear waste (e.g. from medical procedures) endangers their territory and legal rights. As reported in The Guardian, Wallerberdina Station (a cattle station) near Barndioota — less than 500km north of Adelaide in the Flinders Ranges — was originally one of six sites selected for the proposed nuclear dump last year, but now it’s the only location under consideration after a “four-month consultation process.” I’m not sure who was consulted, but it doesn’t appear to be the Adnyamathanha. “This is our land, we have been here forever and we will always be here and we are totally opposed to this dump,” says Vince Coulthard, the Adnyamathanha Traditional Lands Association (ATLA) chief executive, to The Guardian. Apart from calling the move “cultural genocide,” Coulthard adds that the community has been mostly excluded from the decision-making process. But, hey, the Adnyamathanha will be compensated for, so that’s something — right? As reported in The Guardian, Josh Frydenberg MP, the Minister for Resources, Energy and Northern Australia, explains that the Adnyamathanha community will receive $2m for local projects and $10m if the Wallerberdina Station is ultimately selected. Frydenberg adds that consulting the aboriginal community is the next wave of the process — even though it should’ve been a priority since the process’ inception, in my humble opinion. If you’re from the United States, then this whole ordeal should sound somewhat familiar. When I wrote about the massive mine spill caused by the EPA near the Navajo Nation last year, it was hard not to reflect on the ways indigenous communities experience environmental injustice. The Navajo Nation is probably the most infamous and prominent example with its long history of uranium mining that caused high rates of cancers and lung disease in the community. Environmental injustice just doesn’t compromise the physical health of the locals. It also compromises the environment, and, ultimately, the cultural health. To this day, many indigenous identities are intricately tied to ancestral lands. By polluting sacred, ancestral and/or historical sites, these companies and governments are also polluting ancestral memories and robbing future generations of their ancestral identities. Millions of dollars can never compensate for these past and future losses. Cultures, languages, traditions and stories that have survived centuries of colonization are national treasures — not nuclear dumping sites. 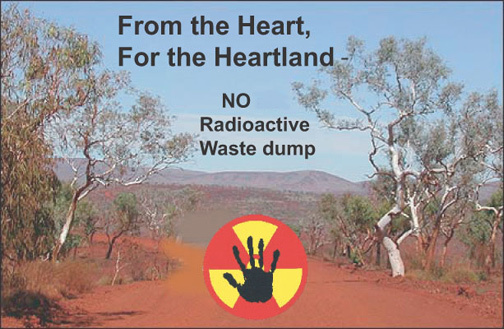 The final decision for the nuclear dumping site will occur in a year, please act now by signing and sharing this petition urging Australian leaders not to dump nuclear waste near Adnyamathanha territory. On March 30, the Ministry of Environment (MOE)’s working committee decided to allow the use of contaminated soil (lower than 8,000 becquerel/kg) for public works nationwide with “proper containment measures.” The committee argues that the additional effective dose for residents will be less than 10µSv/year, but the Nuclear Reactor Regulation Act specifies 100 becquerel/kg or less as the threshold for reusing concrete and metals from nuclear power plants. Therefore, MOE’s latest policy increases the threshold eightyfold. We should not allow the government to loosen the regulation and spread the contaminated soils our environment. Please sing our petition via Google forms ( https://goo.gl/37E4dZ ) or via Change.org ( https://goo.gl/37E4dZ ). You can read the whole statement here http://www.foejapan.org/en/energy/doc/160427.html . Petition Stand in solidarity with Chernobyl survivors! Petition Stand in solidarity with Chernobyl survivors! https://act.greenpeace.org/ea-action/action?ea.client.id=1844&ea.campaign.id=49719 Today five million people in the Ukraine, Russia and Belarus live in areas contaminated by Chernobyl’s radioactive fallout. Every day these survivors must make decisions on how to reduce or limit their exposure to radiation. Shopping, cooking, eating, working outside or heating their homes are daily choices that can put their families at risk. They are being abandoned by their governments who are not taking adequate care of their citizens. Their governments scramble to cut protection programs that ensure needed monitoring, health treatments and uncontaminated food. This is so they can save money. Worse still, these same governments want to spend billions on extremely risky nuclear energy while ignoring their responsibility to support those who still live in the shadow of Chernobyl’s radioactive legacy. It is unjust to cut programs to protect Chernobyl survivors. And it’s madness to spend more money on nuclear power when safe and clean renewable energy is affordable and ready to empower communities. Please stand in solidarity with Chernobyl survivors. Tell the leaders of Ukraine, Belarus and Russia to reinstate programs to protect Chernobyl survivors from radiation exposure and ensure another Chernobyl never happens again by investing in modern and affordable renewable energy. Help stop A Global Mobile Chernobyl! Nuclear Information and Resource Service, 23 Apr 16, A group of politicians and business people are developing a plan to build an international high-level nuclear waste dump in South Australia–a nation that has no commercial nuclear reactors. The plan is strongly opposed by many South Australians and by an overwhelming majority of Aboriginal people, who own the land. The Australian Nuclear Free Alliance, representing Aboriginal people from across Australia, calls on nuclear nations NOT to dump nuclear waste in Australia. The nuclear industry has a track record of Aboriginal dispossession and environmental pollution–from atomic bomb tests to uranium mining to nuclear waste dump proposals. NIRS is supporting our friends in Australia and we hope you, and your organization, will too, by signing on to a petition of support by going here. You can also learn more about the issue at this site. Individuals: please sign the simple statement of support below. Thank you for your commitment to “Keep It in the Ground” by your efforts to stop uranium mining in your lands. We stand with you. We, the people, must and will stop the dirty, deadly and deceptive nuclear industry. We have heard that your lands are now being targeted by global nuclear waste companies. We are the community of Nuclear Information and Resource Service supporters. Collectively and as individuals, we commit to speak out and act to prevent your home from becoming a dumping ground for global nuclear waste. Our planet and our struggle is shared and NIRS and ANFA are stronger together. Thank you for standing for health, hope and your home. We stand with you. The top official involved has now RESIGNED due to the seriousness of these allegations. Read more. The Trans-Pacific Partnership (TPP) is a massive, legally binding deal between 12 countries that was negotiated in complete secrecy by industry lobbyists and government bureaucrats. It has sparked international outcry, and expert’s analysis of the text show it poses a grave threat to the economy, theenvironment, the Internet, national sovereignty, and freedom of expression. Japan’s economic and fiscal policy minister, a top official involved in negotiating the TPP, has been accused of taking major bribes from a Japanese construction company amounting to at least $148,000. It’s not clear yet whether the bribe was related to the TPP itself, but it underscores the danger of these shadowy, corrupt, agreements. This is exactly why decisions that affect billions of people should never be made in secret. This is exactly why the TPP is such a threat. President Obama is expected to sign the agreement on February 4th, but this bribery scandal could derail that if enough people speak out right away. Sign the petition to tell Obama not to sign the TPP amidst public outcry and scandalous corruption. Then share it with as many people as you can! Closing the Pickering Nuclear Station when its license expires in 2018 and getting to work on dismantling the plant immediately will be safer, create more jobs between now and 2030, and save hundreds of millions of dollars. That’s the finding of a new report commissioned by Ontario Clean Air Alliance Research from energy consultants Torrie Smith and Associates. Torrie Smith compared Ontario Power Generation’s (OPG’s) plan of leaving the plant untouched for 30 years before starting decommissioning to the internationally preferred approach of immediate decommissioning. They found that getting to work immediately would create 16,000 person years of employment, save $800 million to $1.2 billion on decommissioning costs, and ensure a smoother transition for workers and the local economy. In fact, Torrie Smith points out that the only reason to leave Canada’s oldest nuclear plant sitting idle on the Pickering waterfront for the next 30+ years is money. While there is enough money in OPG’s Decommissioning Fund to fully cover the costs of decommissioning Pickering today, OPG would prefer to wait and let investment returns over the next three decades do the heavy financial lifting. The Pickering Nuclear Station is North America’s 4th oldest and one of the largest nuclear stations on the continent. We should not leave this legacy of a bygone era to future generations to deal with. Instead, we should seize the opportunity to develop expertise in a growing new industry – nuclear decommissioning. Given that Canada’s nuclear industry hasn’t sold a new reactor in 30 years, the future of our nuclear industry clearly lies in providing the expertise to safely decommission old nuclear facilities – including other aging CANDU reactors in Canada and around the world. Please send Premier Wynne a message here asking her to order OPG to develop an immediate decommissioning plan for Pickering and to close this dinosaur by 2018 (when its license expires) at the latest. Petition to UK’s George Osborne – ABANDON HINKLEY NUCLEAR PROJECT ! George Osborne is on the cusp of wasting billions on nuclear power. The new nuclear plant he wants to build at Hinkley in Somerset is set to be the most expensive object on Earth – and already it’s at least 8 years overdue. While Hinkley continues to suffer huge delays, and serious questions are being raised about the safety of the reactor, the cost of renewable energy is falling. Rumours are now spreading that EDF – the company that wants to build Hinkley – could pull out of the deal, meaning the whole project could be on the rocks. Let’s seize this moment to pile the pressure on George Osborne.A huge petition could convince him to abandon the project and back renewable energy instead. 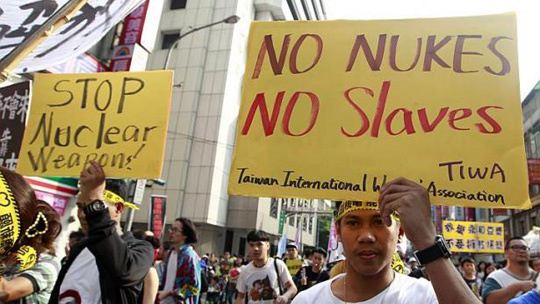 Anti-nuclear rallies set for March 12 http://www.taipeitimes.com/News/taiwan/archives/2016/02/26/2003640263 By Chen Wei-han / Staff reporter A number of rallies have been scheduled for March to mark the fifth anniversary of Japan’s Fukushima Dai-ichi nuclear disaster and back calls for a speedy phasing out of nuclear power and treatment of radioactive waste, anti-nuclear proponents said yesterday in Taipei. They told reporters that coordinated protests would be held on March 12 in Taipei, Tainan and Kaohsiung, along with a forum in Taichung, to call on the central government to stop all nuclear development and decommission the nation’s nuclear power plants. Performances and installation art projects inspired by the Fukushima Dai-ichi disaster would be included in the protests, such as “radiation money” and a giant banner to symbolize the 24,000-year half-life of radioactive waste. “An earthquake this month leveled a housing complex in Tainan, causing heavy casualties. The Ma-anshan Nuclear Power Plant [in Pingtung County] is located on a fault line, and earthquakes might damage the plant and harm to numerous people,” Citizen of the Earth Foundation Taipei office director Antonio Chou (周東漢) said. Northern Coast Anti-Nuclear Action Alliance chief executive Kuo Ching-lin (郭慶霖) said this year could be a critical one. “The anti-nuclear movement reached new heights over the past year with the sealing of the Lungmen Nuclear Power Plant [in New Taipei City’s Gongliao District (貢寮)], while the incoming government has pledged to establish a nuclear-free nation. We must seize the opportunity and continue the movement to speed up the deactivation process,” Kuo said. Platform members said the two operational nuclear plants in New Taipei City must be decommissioned as soon as their spent fuel pools are full, even if that proves to be earlier than their scheduled decommissionings in 2018 and 2019 respectively, while the mothballed Lungmen plant should be scrapped. The Democratic Progressive Party has vowed to phase out nuclear power by 2025, and now that the party has a legislative majority, it is time for it to make good on its promise and place the passage of nuclear-free legislation and an energy tax on the top of its legislative agenda, Green Citizens’ Action Alliance secretary-general Tsuei Su-hsin (崔愫欣) said. However, while political parties have made promises about phasing out nuclear energy, no promise has been made about the nuclear waste issue. We have to make the new legislature and the new government face up to these issues,” Tsuei said. Yilan Charlie Chen Foundation chairman Chen Hsi-nan (陳錫南) called for the passage of nuclear waste laws, saying the complexity of the issue is the result of the lack of legal regulations and the lack of an independent authority on radioactive waste, which has allowed the Taiwan Power Co to monopolize the management of nuclear waste in the nation. Anti-nuclear protests are now planned for March 12 http://www.chinapost.com.tw/taiwan/local/taipei/2016/02/26/459275/Anti-nuclear-protests.htm TAIPEI--A national anti-nuclear alliance is scheduled to hold a protest march in Taipei March 12, demanding that the government make Taiwan nuclear-free by 2025 by decommissioning the nation’s three functioning nuclear plants and abolishing the mothballed fourth nuclear power plant in New Taipei’s Gongliao District. The National Nuclear Abolition Action Platform, which is organizing the march, announced Thursday that it will be held to mark the fifth anniversary of Japan’s Fukushima nuclear disaster of 2011 and raise public awareness of the dangers of nuclear power and the pressing problem of nuclear waste management.The anti-nuclear activists will also demand that the government come up with solutions to the storage of highly radioactive nuclear waste and to the problem of environmental injustice in nuclear waste siting policies. They are also seeking the establishment of a mechanism that will allow public participation in policy-making regarding nuclear waste management. FIVE YEARS AFTER FUKUSHIMA, GREEN CROSS ASSESSES LEGACY OF DISASTER Green Cross is organizing a dialogue with international experts in Zurich on 30 January to shed light on the consequences of nuclear disasters in Japan and the former Soviet Union. This year marks the fifth anniversary of the Fukushima catastrophe, and the 30th anniversary of the Chernobyl meltdown. Both of those incidents continue to affect the people and environment of surrounding regions to this day. Green Cross has been working on the ground at Fukushima ever since the disaster hit, and has over 20 years’ experience helping victims of Chernobyl in Russia, Ukraine and Belarus. The Zurich conference brings together experts and practitioners from Japan, Russia and Switzerland to share their experiences and participate in a frank exchange about the state of atomic energy in the world today. The event will run from 13h30 to 15h30 in the EPF’s Maximum auditorium (Ramistrasse 101, 8092 Zurich). It will feature former Japanese Prime Minister Naoto Kan, Swiss Professor Dr. Horst-Michael Prasser, Green Cross’ own Dr. Stephen Robinson, Prof. Jonathan Samet from the University of Southern California, and Professor Dr. Vladimir Kusnetsov from the Moscow Electrotechnical Institute. The panelists will each make a presentation, after which they will respond to audience questions. Simultaneous translation will be provided in English, German, Japanese and Russian.